Four major comprehensive reports have been published recently, by national and international professional organizations, American Heart Association (AHA), The Georgia Institute for Global Health (GIGH), Million Death Study Collaborators (MDSC), and Public Health Foundation of India (PHFI).,,, In the study reported by the George Institute for Global Health (GIGH), researchers used data from two large surveys carried out between 2012 and 2014, which included a sample of 797,540 adults aged between 30 and 74 years across India. The main outcome was the predicted 10-year risk of a cardiovascular (CVD) event as calculated with the Framingham Risk Score. In addition, the Harvard-NHANES, Globorisk, and the World Health Organization (WHO)-International Society of Hypertension risk scores were also used for secondary analysis. They found that patterns of variation in CVD risk among the Indian the population were similar across all four risk scoring systems. This study was timely, as there has been no large-scale population-based study, which has examined how CVD risk varies among such a diversified Indian population. Furthermore, understanding the variability in different population groups within the country could provide useful information for targeted intervention for those who need most. Having said that, we should examine as to how this knowledge about the variability in CVD risks in different geographic and socioeconomic groups, will improve the way we screen the population for various metabolic risks, develop novel complementary therapies to manage the observed risks, and reduce the incidence of these chronic metabolic diseases. Sounds great and doable. The big question is who is going to do this? Since the severity of the CVD risks is regional, is it the responsibility of the State Government or the Central Government? Given this dilemma, way back in 2005, we published an article expressing the immediate need for a national platform to address the issues related to CVDs and development of action plans, for primary prevention and integrated treatment of heart disease in India. After more than a decade, things have not changed very much. We do not have a national platform in India, to address the issues related to metabolic diseases, and we do not have any national level action plans to monitor, manage or reduce, the epidemic of these diseases. In this overview, we have just changed the title to include metabolic risks, instead of limiting to just CVD risks, and expressed our point of view on this topic. Now let us briefly discuss some of the options we have, to address these issues. We have tried many a times in the past, to convince the Government of India, the importance of developing a national platform for addressing issues related to the metabolic diseases such as hypertension, excess weight, obesity, metabolic syndrome, type-2 diabetes, and vascular diseases without any success. As the founder CEO of SASAT, I have written letters to the Ex-Presidents of India, and to various Ministers of Health and Family Welfare. I had arranged an hour-long discussion with Hon. President Kalam (https://www. youtube. com/watch? v = wzKMwcoqjW0) during our SASAT conference at Hyderabad in 2002. I had written to the Ex-Health Minister Gulam Nabi Azad during his tenure, requesting his help to develop a national platform. As recently as last year, (2017). I had discussions with Union Minister Ashwini Kumar Choubey (at AIIMS, Patna), about the need for a national platform to address the issues of cardiometabolic diseases in India. I am still trying to get an audience with our Prime Minister Hon. Narendra Modi. One may ask why we need such a platform? My simple answer will be, without such a platform, it will be hard to integrate all the affordable healthcare initiatives. For instance, the limited success we have in managing HIV/AIDS in India is related to the activities of the National Aids Control Organization. On the other hand, if you look at the workings of NCD alliance in India, and read the WHO's report for 2017, it becomes evident that even the four modifiable risks that they aim (tobacco, diet, physical activity, and alcohol consumption) to control and build capacity, to reduce and treat NCDs, shows that progress around the world has been uneven and insufficient. In the meantime, all of the above mentioned metabolic diseases have gained the status of epidemics or “tsunamis.” According to the Global Burden of Disease report (2017), obesity has doubled in the last three decades and type-2 diabetes by 4-fold. Just to give readers an idea, as to what has happened in the last three decades, I will provide my own personal experience. When I visited Beijing, China, in the early 1990s, I could see bicycles everywhere, and the incidence of diabetes was at its lowest tide. In the last three decades, bicycles have totally disappeared in Beijing, and diabetes has increased by 17-fold. Framingham heart studies in the USA, have described the modifiable risk factors that promote the development of CVDs. Several clinical trials have demonstrated that management of modifiable risk factors, significantly reduce CVD-related mortality and morbidity. Indeed, just robust management of lifestyle has been shown to drastically reduce the development of acute vascular events., Having said that, I would like to remind the readers that in spite of these observations, CVD has remained the number one killer worldwide, for the past 100 years. What does this mean? Where did we go wrong? Are we barking up at the wrong tree, when it comes to risk factors? These are some of the important questions that need answers. Considering this awkward situation, we have developed a hypothesis which has been advocated by some of the top international scientific leaders. Given these observations heralding the importance of monitoring hardening of the arteries, let us discuss some of the methodologies used for the early diagnosis of this altered vascular condition. There are various methodologies available for monitoring ED. At the University of Minnesota, clinicians and researchers use CV-Profiler, developed by the Hypertension diagnostics [Figure 1] of Minnesota. In India, researchers have used Periscope, developed by Genesis Medical Systems of Hyderabad, India. Dr. Ravi Kasliwal and associates at Medanta Hospitals, New Delhi, India, have used this system to monitor prehypertensives. Dr. Albert Maarek of Miami, Florida has put together a novel noninvasive diagnostic platform, which develops information on a verity of cardiometabolic risks, including ED., All of these devices are useful at clinics, for monitoring flow dynamics and arterial stiffness. Yet they are not cost-effective and are not easy to use, for conducting population-based clinical studies. Manufacturers of this device (CV-Profiler) claim, that the method measures noninvasively, the elasticity of large and small arteries providing an early assessment of CVD disease. Additional claims include that the method is suitable for the early detection of atherosclerotic disease, for clinically evaluating the efficacy of prescribed lifestyle modifications and medications, monitoring patients with hypertension, identifying patients with abnormal arterial function indicative of ED, and targeting those patients in need of aggressive medical intervention. Periscope-pulse waveform monitor system developed in Hyderabad India, unlike the high-density lipoprotein Diagnostics' device, develops data from four different pulse points. 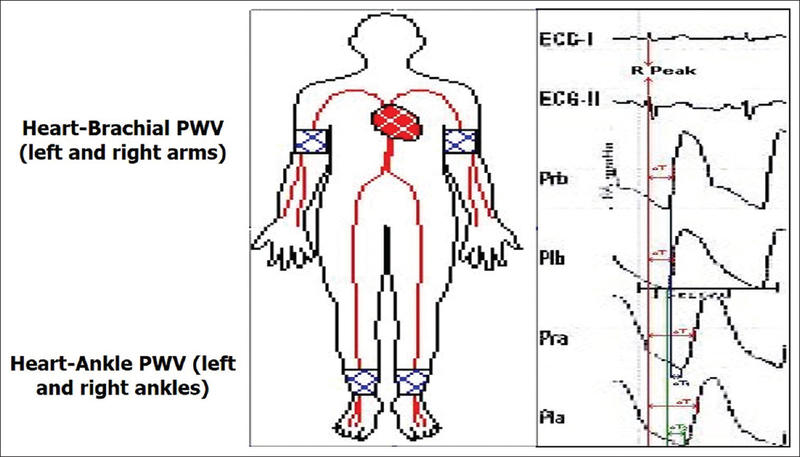 As shown in [Figure 2], pulse wave velocity (PWV) is measured both at brachial pulse points and ankle pulse points. PWV is the speed at which the blood pressure pulse travels from the heart to the peripheral artery after blood rushes out during contraction. It is mainly used to evaluate the stiffness of the artery wall. As elasticity or compliance of artery decreases, the capacity of the artery to expand (dilate) also decreases. This leads to an increase in blood flow (pulse wave) velocity. PWV increases with the stiffness of the arteries. In addition to the diagnostic systems discussed earlier in this article, there are two other Food and Drug Administration (FDA, USA) approved systems in common use, the AtCor SphygmoCor XCEL (atcormedical.com) and Complior (www.complior.com), which differ with respect to their sensor technology, and the algorithms used for calculating the pulse propagation time. The SphygmoCor device uses an arterial tonometer, for recording pressure waveforms. Propagation time is measured from the foot of the carotid waveform to that of the femoral waveform using sequential recordings, referenced to the ECG. In the Complior system, carotid and femoral waveforms are recorded simultaneously, using mechanotransducers (https://www.ncbi.nlm.nih.gov/pubmed/24509122). As mentioned earlier, these methodologies are quite useful for monitoring arterial stiffness or ED at the clinics. What we need is a hand-held, cost-effective device, that can monitor the blood flow dynamics and relay the data to smart, analytical platforms. The fact that we could monitor pulse waveforms using the TM-Oxi system, which uses oximeter and blood pressure monitors, encourages that development of a hand-held ED-monitor is feasible. We are also exploring the idea of developing modified ultrasound apps, which can measure flow dynamics in peripheral arteries and veins. Yet another possibility we are exploring, is the use of piezoelectric flexible pressure sensors, to obtain data on PWV at various pulse points. These pressure sensors could be applied at various pulse points using wearable bands. The data generated at pulse points could be relayed to smart, analytical platforms for further processing. Successful development of such cost-effective, hand-held, diagnostic devices will facilitate screening for early changes in the vascular physiology and function at the population level. When considering various methodologies to assess the dynamics of blood flow and alterations in the pulse wave forms, one should validate, whether all these methodologies are monitoring the same vascular function, that is ED? A recent review by US Preventive Services Task Force (USPTF) found inadequate evidence to support the hypothesis, that treatment decisions guided by ankle-brachial index (ABI), C-reactive protein (CRP), or Coronary artery calcium (CAC) score test results, when added to existing CVD risk assessment models, lead to reduced incidence of CVD events or mortality. Of the three tests referred to in these studies, only ABI represents an earlier risk, the other two, hsCRP and CAC are later events in the disease progression. Yet the inclusion of these studies for risk score calculation is definitely an improvement, as it indicates a willingness to include nontraditional risk factors for risk calculations. Continuing in the same lines of thinking, we would like to suggest the inclusion of a couple of other early risk factors such as oxidative stress, and inflammation, in the development of preventive strategies. We already have discussed various methodologies for monitoring ED and let us briefly discuss the other two early markers of altered metabolism. There is considerable evidence, to suggest an important role for the overproduction of reactive oxygen species (ROS), in the pathogenesis of vascular diseases. These ROS can be released from nicotinamide adenine dinucleotide oxidase, xanthine oxidase, lipoxygenase, mitochondria or the uncoupling of nitric oxide synthases., The transcription factor nuclear factor erythroid 2–related factor 2 (Nrf2) for instance, a master regulator of detoxification, anti-oxidant, anti-inflammatory, and other cytoprotective mechanisms, is raised by health promoting factors. This transcription factor activates the transcription of over 500 genes (so-called survival genes) in the human genome, most of which have cytoprotective functions. The most healthful diets such as the Mediterranean and Okinawa are rich in Nrf2 raising nutrients. Recent studies however, have demonstrated that induction of Nrf2 and Ho-1 expression by Protandim (a mixture of five phytochemicals; Ashwagandha, Indian Bacopa, Indian Green Tea, China Milk Thistle and China Turmeric) is associated with a reduction in oxidative stress and fibrosis, preservation of the right ventricular (RV) microcirculation and RV function. Studies by the pioneer scientist, professor Joe M McCord, and associates on the effect of Protandim on various pathways have shown, significant modulation by Protandim not only of pathways involving antioxidant enzymes but also those related to colon cancer, CVD disease, and Alzheimer's disease., We suggest that it is time that we develop similar complementary therapies using various herbal products and simple clinical studies (not clinical trials) to validate the safety and efficacy of such indigenous formulations. Inflammatory response of the blood vessels involve complex signaling between inflammatory cells (neutrophils, lymphocytes, monocytes, and macrophages), endothelial cells, vascular smooth muscle cells, and extracellular matrix components.,,,, Persistent increase in cytokines, seem to be associated with vascular dysfunction, and vascular diseases such as subclinical atherosclerosis, ED, and hypertension. Furthermore, researchers at the Children's National Memorial Hospital in Washington DC, have demonstrated yet another mechanism, by which adipose tissue can induce an inflammatory response. Their studies have shown that adipocyte-derived exosomes (micro RNAs) contain mediators, capable of activating end-organ inflammatory and fibrotic signaling pathways. Association between hyperglycemia and inflammation, in the initiation and promotion of vascular complications, is well established. Obesity and oxidative stress, also results in chronic inflammation of the vessels, as demonstrated by elevated CRP. Studies from Minnesota, have demonstrated that in children with excess weight, just 8 weeks of moderate exercise, improved fitness, endothelial function and lowered HDL-cholesterol. As we have discussed in our earlier articles on this topic, inflammation is associated with all the major metabolic risks, including in the precipitation of acute vascular events. Professor Paul Ridker, Director of the Center for CVD Disease Prevention, Brigham and Women's Hospital, Boston, Mass, has demonstrated for the first time that lowering the inflammation by using a monoclonal antibody, independent of cholesterol, reduces CVD risk. In a separate study, researchers from Perelman School of Medicine, at the University of Pennsylvania, in collaboration with National Heart, Lung, and Blood Institute, have demonstrated that Ustekinumab, a monoclonal antibody used to treat skin conditions, can also improve aortic inflammation. We are not trying to suggest the use of these antibodies but advocating the development of indigenous complementary therapies, aimed at reducing chronic inflammation. A recent review by USPTF, found inadequate evidence to assess whether treatment decisions guided by -ABI, CRP, or CAC score test results, when added to existing CVD risk assessment models, lead to reduced incidence of CVD events of mortality. What we have to understand, when discussing the results of such studies is, that there is a great difference between risk scores that predict timescale for the development of CVD versus those, that try to predict risk for acute vascular events. No risk score calculator can predict the precise timing for the development of acute vascular events, such as heart attacks or stroke. Just to illustrate this point, let us consider the risks that are commonly used for risk score analysis. They are common modifiable risks such as smoking, physical activity, lipid abnormalities, elevated levels of blood pressure, and blood glucose. None of the existing risk score calculators include parameters related to the functioning of the circulatory system. Whether or not there is detectable ED, or whether or not the circulating blood is prothrombotic of hemorrhagic? Ultimately, the acute vascular events are precipitated due to the narrowing of the arteries, plaque buildup, changes in the circulating blood to a prothrombotic sate, due to the activation of platelets and coagulation pathways. Given these observations, we can say with confidence that none of the risk score calculators or 100% accurate, in predicting the acute vascular events, such as heart attacks or stroke. By providing these comprehensive reports on a complex, chronic disease like CVD, the authors of various reviews have made our task simple. We should study these reports carefully and develop our own guidelines and guidance statements for CVD risk assessment, and management. We also should concentrate on early detection of these risks and develop appropriate interventions. I have discussed in this and other journal articles, the risk factor assessment, risk prediction, and novel management strategies.,,,,,,,,,,,,,,,,,,, I also have discussed in my earlier publications, details about the diagnosis of early risks for metabolic diseases, integration of emerging technologies for the development of novel noninvasive risk assessment platforms. Furthermore, I have emphasized the need for the integration of healthcare, with what is good in Indian Traditional Medicine, with what is good in western medicine, for the development of affordable healthcare. Since the time we started SASAT in 1993, our collective efforts are focused on creating awareness of the incidence of metabolic diseases in India, developing novel diagnostics, complementary interventional therapies, and preventive strategies. Since my retirement from the University of Minnesota, in 2012, I have been working in India, every winter on a variety of projects associated with the exploration of novel integrated technologies for the development of affordable healthcare. In view of the fact that all the metabolic diseases, hypertension, excess weight, obesity, metabolic syndrome, and type-2 diabetes have achieved the status of an epidemic, we the members of the SASAT, feel that there is an immediate need, to address the issues related to creating awareness, early diagnosis of the risks such as oxidative stress, inflammation, and ED, develop simple, cost-effective integrative therapies for observed risks, and integrate emerging technologies, for risk assessment, risk prediction, and risk management.,,,, We have discussed earlier, some technologies useful for monitoring ED. We also have discussed our own efforts to develop handheld devices or wearables that will provide information on pulse waveforms at various regional vascular beds. Now let us discuss some novel methodologies for screening complementary therapies for reduction or reversal of the ill effects of oxidative stress and inflammation. Oxidative stress is by and large considered, as an imbalance between the production of ROS, and their elimination by protective mechanisms. Oxidative stress can induce chronic inflammation and also activate a variety of transcription factors, which modulate the expression of a variety of proinflammatory genes. We already have discussed earlier the use of Protandim to alleviate the ill effects of oxidative stress. Polyphenols from a variety of natural sources have been proposed to be useful as adjuvant therapy for their anti-inflammatory effect. It is well known that many of the major phytochemicals, such as terpenoids, anthocyanins, flavonoids, and polyphenols, possess significant anti-inflammatory properties. Given the bio-diversity that exist in India, we suggest developing simple in vitro as well as in vivo screening methodologies, to test the phytochemicals for their safety and efficacy against proinflammatory pathways. A study from the UK indeed screened 64 medicinal plant products form 61 species using multitarget, cell-based approach; they found three phytochemicals, which were effective in inhibiting NF-kappa B in cells. In these studies, these phytochemicals were also tested against cytokines such as Interleukin (IL)-6, IL-8, and tumor necrosis factor-alpha. By using such simple multi-targeted cell-based assays, we should be able to develop some very potent anti-inflammatory phytochemicals. Four major comprehensive reports have been published recently, by national and international professional organizations (AHA, GIGH, MDSC, and PHFI), in reputed scientific journals, about the incidence of CVDs in India, about the excess incidence of CVD and other related diseases in Indian living aboard and the geographic and sociodemographic variation in CVD risk in India.,, In an earlier article in this journal, we have discussed the incidence of diabetes and CVD in Indians living in India and abroad. We also have supported a study, “India Heart Watch” which focused on lifestyle and its influence in CVDs in different regions across India. This study conducted under the leadership of Prof Rajeev Gupta of Jaipur came to the similar conclusions as that of GIGH studies. The studies by the researchers of PHFI concluded: “Taking control of the CVD epidemic in India needs all the stakeholders, including the policymakers, to acknowledge and address the social determinants that are strongly linked to CVD risk factors and the related morbidity and mortality.” We and others interested in this topic believe strongly that publishing epidemiological data or comprehensive studies like the ones we have reviewed, will not solve the immediate problems associated with these diseases, which have reached epidemic status. We need to establish a consortium of Industrial and Academia experts, which is inclusive in a sense, which will involve all the stakeholders associated with solving these lifestyle diseases. We also recommend the establishment of a “National Institute” to address the issues related to Cardiometabolic diseases. In the meantime, we urge the readers, experts, and the like-minded individuals, to use our SASAT platform headquartered in Medanta hospitals, New Delhi, as a national platform, to discuss an issue related to the effective management of metabolic diseases. Regarding early diagnosis of the risks and effective management of the observed risks, we have discussed in several of earlier articles that in Asian countries like India and China the earliest risk is not at the level of ED but at the level of conception., In Asian countries millions of children or born with low birth weight. Seminal work from the CSI Holdsworth Memorial Mission Hospital, Mysore, India, has demonstrated that this cohort is at “high risk” for developing metabolic diseases. Studies from Harvard scientists have demonstrated that these issues related to maternal and neonatal malnutrition could be alleviated by providing micronutrient supplements. When discussing the early diagnosis of metabolic risks, excess weight and obesity in children should be a top priority.,,,, It has been estimated that worldwide over 22 million children under the age of five or obese and one in 10 or overweight. The proportion of school-going children affected has doubled in the last two decades. Given the fact that there are no established annual visits for health checkups, the majority of the prediabetes and prehypertensives are left out in the preventive programs. According to experts, “for the tracking of obesity and the associated risk factors, childhood is an important period for prevention. Till date, evidence would support preventative interventions that encourage physical activity and a healthy diet, restrict sedentary activities and offer behavioral support. However, these interventions should involve not only the child but the whole family, school, and community. If the current global obesity epidemic is to be halted, further large-scale, well-designed prevention studies are required.” In spite of the concerns and the recommendations of various experts, according to the American Association of Pediatrics (AAP), there's little sign of improvement. Obesity has been doubled in children and quadrupled in adults in the last three decades. New guidelines by the AAP emphasize prevention, rather than just the treatment of this condition. In this mini-review, which expresses our point of view, we have discussed some of our (SASAT) collective efforts in improving the development of complementary diagnostic and therapeutic approaches. Given the fact that clinical studies are time-consuming, expensive and at times not conclusive, we have suggested simple ways of developing clinical studies, to validate and develop evidence-based knowledge about the safety and efficacy of indigenous complementary therapies. Since we consider diagnosis and management of early risks, may reduce, reverse or prevent metabolic diseases, in this overview, we have discussed the role of three early risks; oxidative stress, inflammation, and ED. We are collaborating with various groups in India, in promoting these ideas, and those interested in working with us, either in the area of validating complementary therapies, or development of noninvasive biomedical devices, should contact us. We are looking for novel integrated approaches for the development of affordable healthcare, and we welcome constructive comments and collaborations. Author wishes to express his thanks to Professor Ravi R Kasliwal, the president SASAT, and Dr. Manish Bansal, the secretary SASAT, Medanta Hospitals, New Delhi, India, for their continuing support of his (SASAT) educational activities in India, and for facilitating the publication of this article in the Journal of Clinical and Preventive Cardiology. Volgman AS, Palaniappan LS, Aggarwal NT, Gupta M, Khandelwal A, Krishnan AV, et al. Atherosclerotic cardiovascular disease in South Asians in the United States: Epidemiology, risk factors, and treatments: A scientific statement from the American Heart Association. Circulation 2018;138:e1-e34. Palaniappan LP, Araneta MR, Assimes TL, Barrett-Connor EL, Carnethon MR, Criqui MH, et al. Call to action: Cardiovascular disease in Asian Americans: A science advisory from the American Heart Association. Circulation 2010;122:1242-52. Geldsetzer P, Manne-Goehler J, Theilmann M, Davies JI, Awasthi A, Danaei G, et al. Geographic and sociodemographic variation of cardiovascular disease risk in India: A cross-sectional study of 797,540 adults. PLoS Med 2018;15:e1002581. Rao GH. Need for a national platform and action plans for primary prevention and integrated treatment of heart disease in India. South Asian J Prevent Cardiol 2005;9:133-41. Prabhakaran D, Jeemon P, Roy A. Cardiovascular diseases in India: Current epidemiology and future directions. Circulation 2016;133:1605-20. NCD Risk Factor Collaboration (NCD-RisC). Worldwide trends in body-mass index, underweight, overweight, and obesity from 1975 to 2016: A pooled analysis of 2416 population-based measurement studies in 128·9 million children, adolescents, and adults. Lancet 2017;390:2627-42.
WHO. Global Status Report on Non-communicable Disease 2014. WHO; 2014. p. 298.
WHO. Global Action Plan for the Prevention and Control of NCDs 2103-2020. WHO; 2013. p. 55. Khera AV, Emdin CA, Drake I, Natarajan P, Bick AG, Cook NR, et al. Genetic risk, adherence to a healthy lifestyle, and coronary disease. N Engl J Med 2016;375:2349-58. Fernández-Friera L, Fuster V, López-Melgar B, Oliva B, García-Ruiz JM, Mendiguren J, et al. Normal LDL-cholesterol levels are associated with subclinical atherosclerosis in the absence of risk factors. J Am Coll Cardiol 2017;70:2979-91. Cohn JN, Duprez DA, Grandits GA. Arterial elasticity as part of a comprehensive assessment of cardiovascular risk and drug treatment. Hypertension 2005;46:217-20. Kasliwal RR, Bansal M, Mehrotra R, Trehan N. Relationship of arterial stiffness with hypertension and its management in a North-India population free of cardiovascular disease. J Clin Prevent Cardiol 2012;1:1-8. Maarek AA, Gandhi PG, Rao GH. Identifying autonomic neuropathy and endothelial dysfunction in type 11 diabetic patients. EC Neuropathy 2015;2:63-78. Gandhi PG, Rao GH. The spectral analysis of photoplethysmography to evaluate an independent cardiovascular risk factor. Int J Gen Med 2014;7:539-47. US Preventive Services Task Force, Curry SJ, Krist AH, Owens DK, Barry MJ, Caughey AB, et al. Risk assessment for cardiovascular disease with nontraditional risk factors: US preventive services task force recommendation statement. JAMA 2018;320:272-80. Csányi G, Miller FJ Jr. Oxidative stress in cardiovascular disease. Int J Mol Sci 2014;15:6002-8. Madamanchi NR, Vendrov A, Runge MS. Oxidative stress and vascular disease. Arterioscler Thromb Vasc Biol 2005;25:29-38. Bogaard HJ, Natarajan R, Henderson SC, Long CS, Kraskauskas D, Smithson L, et al. Chronic pulmonary artery pressure elevation is insufficient to explain right heart failure. Circulation 2009;120:1951-60. Hybertson BM, Gao B, Bose SK, McCord JM. Oxidative stress in health and disease: The therapeutic potential of Nrf2 activation. Mol Aspects Med 2011;32:234-46. McCord JM, Fridovich I. The biology and pathology of oxygen radicals. Ann Intern Med 1978;89:122-7. Donath MY. Targeting inflammation in the treatment of type-2 diabetes: Time to start. Nature Rev Drug Dis 2041;3:465-76. Kelly AS, Wetzsteon RJ, Kaiser DR, Steinberger J, Bank AJ, Dengel DR, et al. Inflammation, insulin, and endothelial function in overweight children and adolescents: The role of exercise. J Pediatr 2004;145:731-6. Ridker PM, Everett BM, Thuren T, MacFadyen JG, Chang WH, Ballantyne C, et al. Antiinflammatory therapy with canakinumab for atherosclerotic disease. N Engl J Med 2017;377:1119-31. Sprague AH, Khalil RA. Inflammatory cytokines in vascular dysfunction and vascular disease. Biochem Pharmacol 2009;78:539-52. Ferrante SC, Nadler EP, Pillai DK, Hubal MJ, Wang Z, Wang JM, et al. Adipocyte-derived exosomal miRNAs: A novel mechanism for obesity-related disease. Pediatr Res 2015;77:447-54. University of Pennsylvania School of Medicine. Drug that treats psoriasis also reduces aortic vascular inflammation: Randomized trial shows 19 percent improvement over placebo group. ScienceDaily; 2018. Available from: https://www.sciencedaily.com/releases/2018/02/180216110541.htm. [Last accessed on 2018 Aug 21]. Rao GH. Risk assessment, risk prediction, and effective management of risk factors for cardiovascular diseases. Editorial J Clin Prevent Cardiol 2012;1:9-10. Rao GH. Prevention of vascular disease and development of affordable health care for all: Thinking out of box. View point. J Clin Prevent Cardiol 2012;1:31-4. Rao GH, Gandhi PG. Need for a non-invasive diagnostic platform for early detection and management of cardio-metabolic disorders. J Clin Prevent Cardiol 2014;3:93-8. Rao GH. Prevention or reversal of cardiometabolic diseases. J Clin Prevent Cardiol 2018;7:22-8. Rao GH. Flow velocity, fluid dynamics and vascular pathology. Sci Pages Heart 2016;1:001. Rao GH. Management of diabetes epidemic: Global perspective. EC Endocrinol Metab Res 2018;3:63-72. Rao GH, Bharathi M. Mother and child:First step for prevention of cardiometabolic diseases. J Cardiol (Photon J) 2016;109:179-86. Rao GH. Integrative approach to the management of cardiometabolic diseases. J Cardiol Cardiovasc Sci 2018;2:37-42. Rao GH. Vascular disease risks: Known and the unknown? J Cardiol 2018;2:000127. Rao GH. Non-traditional approaches to the diagnosis and management of type-2 diabetes mellitus: Point of view. J Diabetes Metab 2015;6:489. [doi: 10.4172/2155-6156.1000489]. Rao GH. Integration of novel technologies for the management of type-2 diabetes. Arch DiabetesObes 2018;1:ADO.MSID.000102. Rao GH. Management of excess weight, and obesity: A global perspective. Interv Obes Diabetes 2018;1:IOD000523. Rao GHR: Integrative approach to the management of cardiometabolic diseases. J Cardiol and Cardiovasc Sci 2018; 2:21-42. Diagnosis of early risks, management of risks and reduction of vascular diseases. J Clin Cardiol Diagn 2018;1:1-11. Risk prediction, assessment, and management of type-2 diabetes. Review. EC Endocrinol And Met Res 2018;3:30-41. Rao GH. Cellular and molecular approaches to therapy. Clin Med Pathol 2018;1:DCMP. 000511. Rao GH. Diabetes and cardiovascular disease in South Asians: A global perspective. J Clin Prev Cardiol 2018;7:161-7. Rao GH. Diagnosis of early risks, management of risks, and reduction of vascular disease. J Clin Cardiol Diagn 2018;1:1-11. Bremner P, Rivera D, Calzado MA, Obón C, Inocencio C, Beckwith C, et al. Assessing medicinal plants from South-Eastern Spain for potential anti-inflammatory effects targeting nuclear factor-kappa B and other pro-inflammatory mediators. J Ethnopharmacol 2009;124:295-305. Kawai K, Spiegelman D, Shankar AH, Fawzi WW. Maternal multiple micronutrient supplementation and pregnancy outcomes in developing countries: Meta-analysis and meta-regression. Bull World Health Organ 2011;89:402-11B. Ranjani H, Mehreen TS, Pradeepa R, Anjana RM, Garg R, Anand K, et al. Epidemiology of childhood overweight & obesity in India: A systematic review. Indian J Med Res 2016;143:160-74. Kar SS, Kar SS. Prevention of childhood obesity in India: Way forward. J Nat Sci Biol Med 2015;6:12-7. Misra A, Bhardwaj S. Prevention and impact of childhood obesity in India. J Clin Prev Cardiol 2014;3:5-11. Ke C, Gupta R, Xavier D, Prabhakaran D, Mathur P, Kalkonde YV, et al. Divergent trends in ischaemic heart disease and stroke mortality in India from 2000 to 2015: A nationally representative mortality study. Lancet Glob Health 2018;6:e914-23. Ells LJ, Campbell K, Lidstone J, Kelly S, Lang R, Summerbell C, et al. Prevention of childhood obesity. Best Pract Res Clin Endocrinol Metab 2005;19:441-54.